Whirligigs Party Co: A Birthday Construction Party! 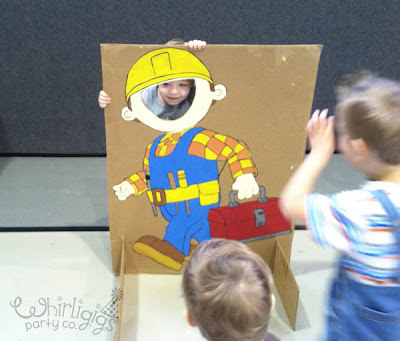 This 3rd birthday construction themed party was such a thrill for me to help plan and the kids... especially the "BOB" lovers were thrilled as well! The venue was a gymnasium. 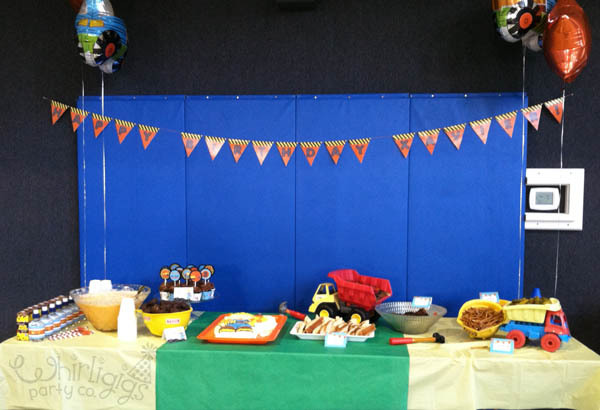 I totally love gymnasiums for parties with kids, especially when outside is not an option. 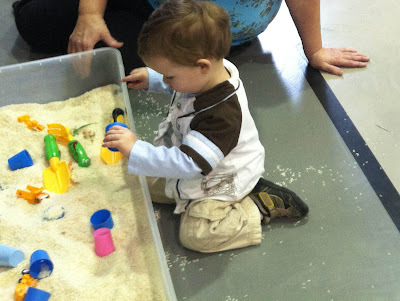 There was TONS of space for the kiddos to run around and visit each activity station. 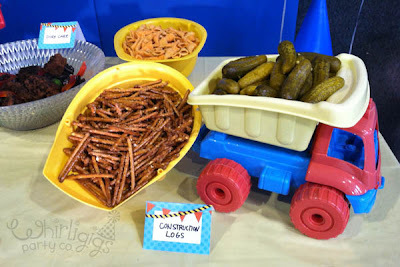 Plus, easy clean up if something spills, and this was one "dirty" party! :) We used a church gym, so double bonus... it was free! However if you can't access a free one, most community centers will rent out gymnasiums for parties. Finding one with a kitchen attached, and available tables to borrow will save you lots of hassle in the end. Our construction zone treat table featured (cleaned, of course) toy trucks and upside down builder hats for serving food. 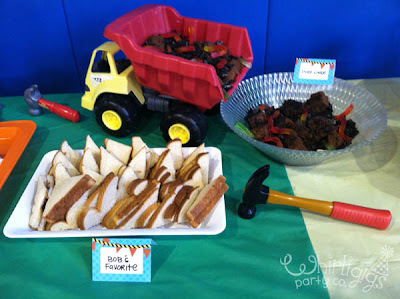 Check out our very dumpy chocolate "dirt" cake centerpiece, complete with worms! 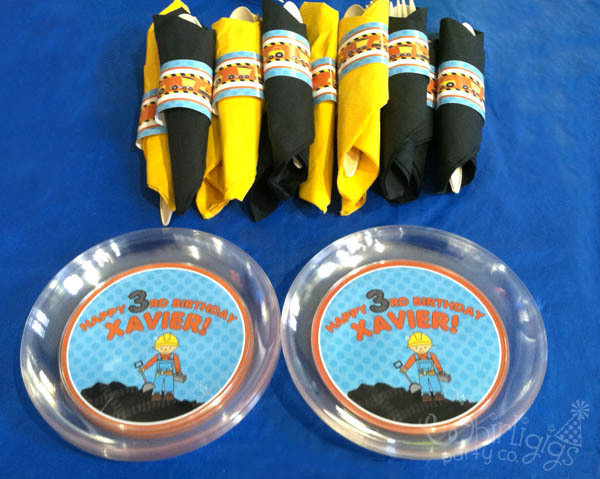 Fun to design, were the 3D wheel cupcake toppers. 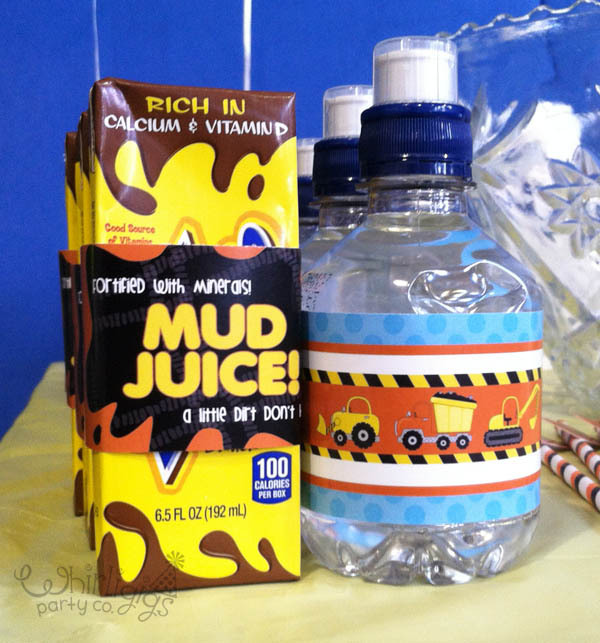 And the mud juice labels were a special request from the birthday mom. They were quite a hit wrapped around boxes of chocolate milk. 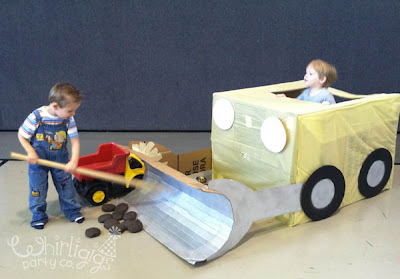 The birthday mom came up with lots of great activities tailored for toddlers... An under the bed plastic storage bin filled with rice, toy trucks and shovels made the perfect indoor dig pit. 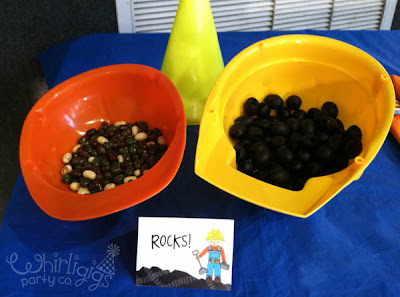 And it was a great sensory activity for little kids! There was a coloring station with some simple coloring sheets made with the builder graphics used in the party decorations. 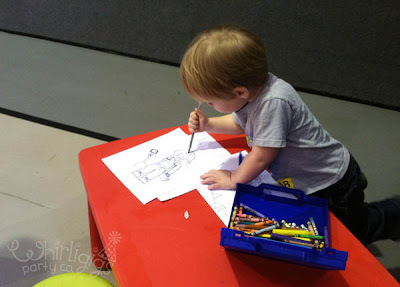 The colored sheets made fun party souvenirs for the kids to take home. 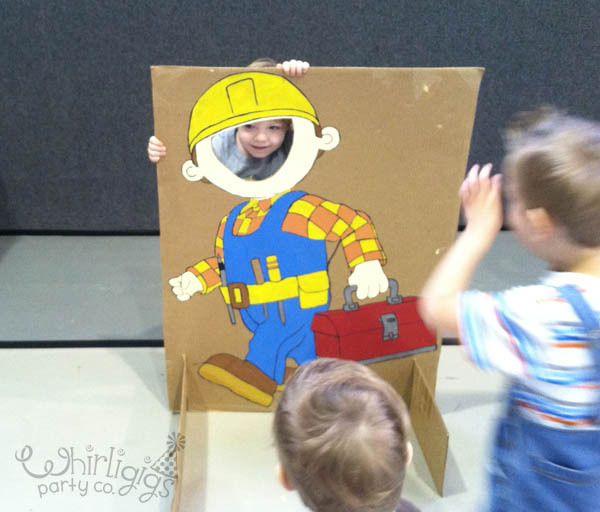 There was a rock bean bag toss, an awesome Bob The Builder photo prop, and a pin the tools on Bob game. But the bulldozer made from a large appliance box entertained the kids the most! They loved playing inside and popping their heads out the top. 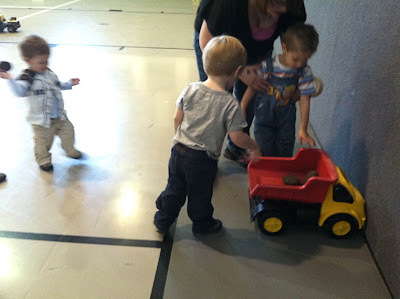 And placing the bean bag "rocks" in the big scooper as they pushed the truck around the gym floor. So much fun!!! My props to the Birthday Mom for crafting such amazing party activities, all d.i.y. and on a budget too!!! She did awesome, don't you think?? 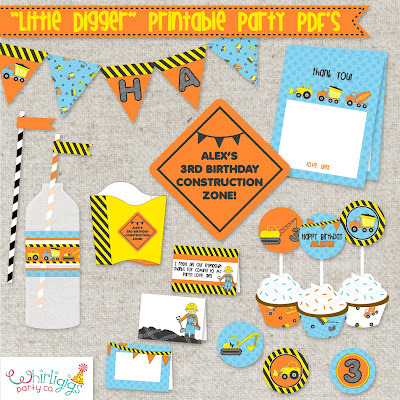 The juvenile color palette of our "Little Digger" collection is bright and easy to match with. The numbers you see on the crane and in the pattern pieces are customizable to your child's age & also customizable is the skin color of the little builder. 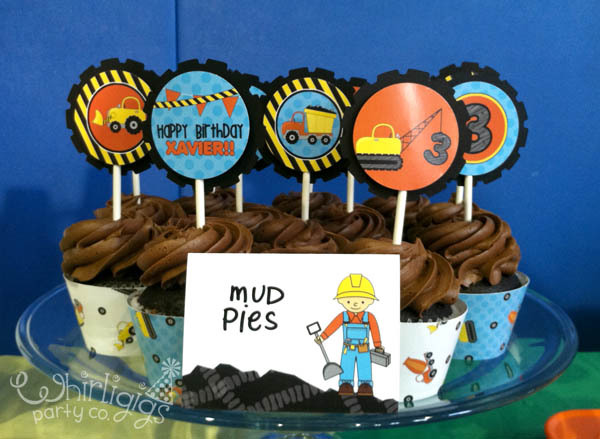 Let us help "build" you a memorable construction themed birthday party HERE!